With the nasal mucus dripping down, it mask can only belongs to the clown of the mask dance, the bondres. 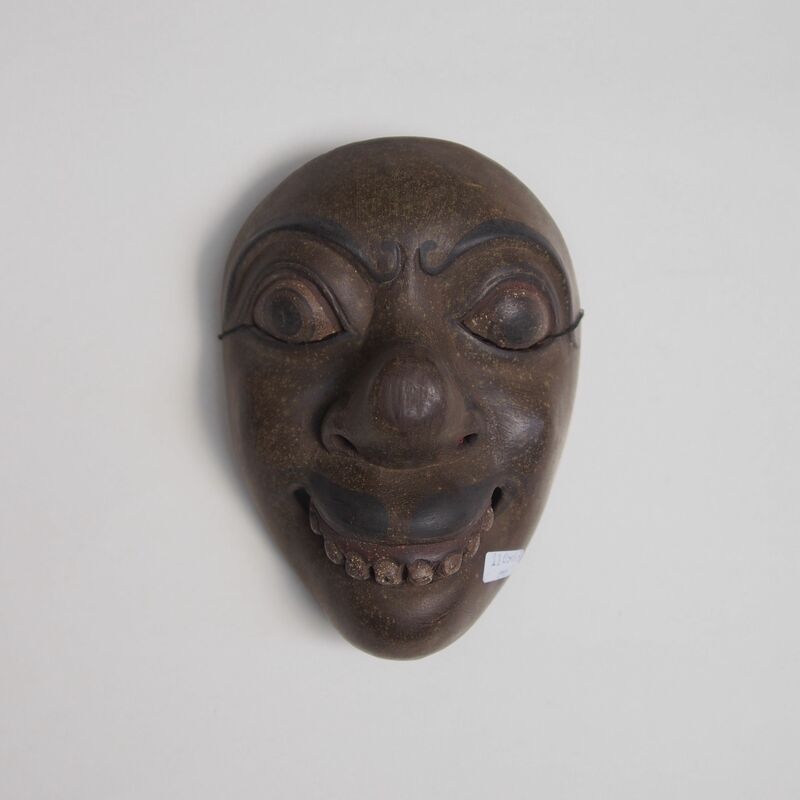 The half mask enable them to tell jokes and engaged in comical dialogues. Bondres Dukuh is the advisor to King Raja, in the dance he also is the means to broadcast the king’s commands. As a comic Bondres Dukuh is a lame spiritual leader, a bit deaf and blind, his speech are filled with coughs and jokes about betel nut. Topeng Tua is an old man character who appears at the opening of the performance as well as in religious ceremony Tari Topeng Tua which would be performed in the temple piodalan. Other character would aslo include topeng Keras, topeng Dalem, topeng Penasar. Click here to see our other topeng. Ground Opera is performed in at the end of the Chinese New Year, on the day of Yuan Xiao. The story performed in the Ground Opera are solely about warfare and battles, romance and other dramas script are nonexistent. This is due to the fact that the origin of the performance is basing on the welfare, though the performers are ordinary farmers, their ancestors were military settlement dated back to the Ming dynasty. They still have the warrior’s spirit running in them. It is believed that the spirits of these fighters will returned during the performance, helping to cast away any evils and to bless the village for the coming year. Rituals are performed before and after the shows. Also unlike other Chinese operas, the character of the Ground Theatre is not defined by the category of Sheng, Dan, Jing, Chou. The main characters in the show are all warriors, broadly divided into male and female (by the eyebrow), old and young (by the beard), temperament (by facial colour), hero and villain (by the facial marking). From this we can determined that this mask would belong to the role of a loyal villian warrior fighter. 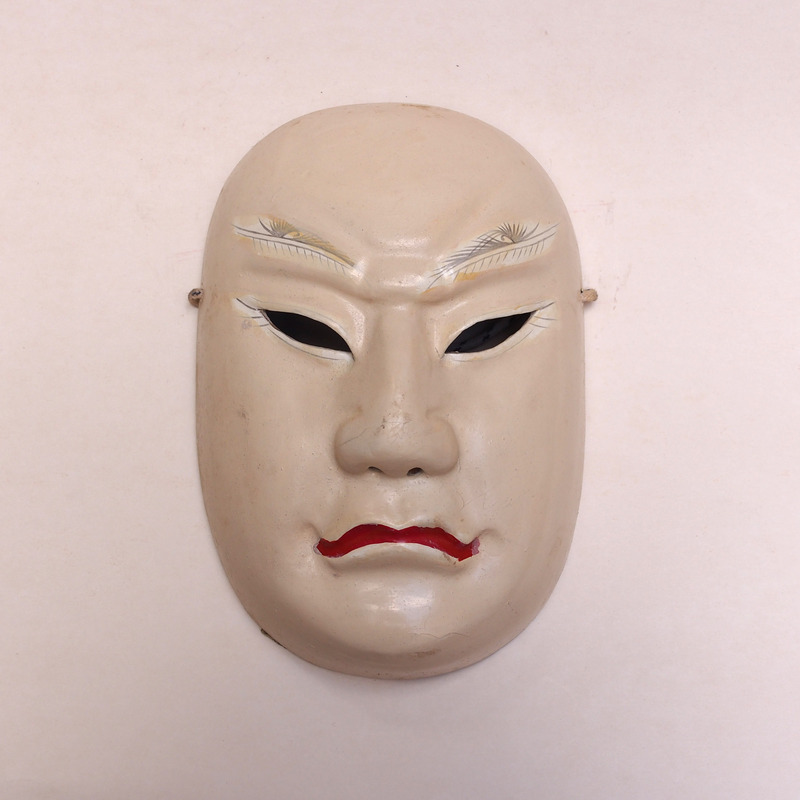 The white coloured face most often denote a villain in the Chinese opera. 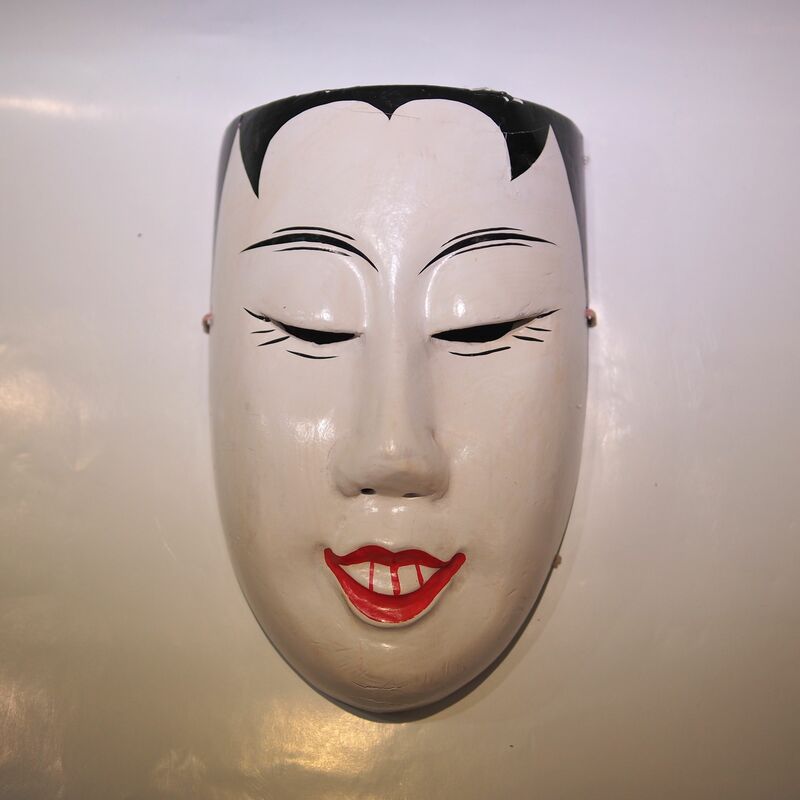 This is a mask of the Qin dynasty prime minister Zhau Gao. In the opera story, “Yu Zhou Feng” (Sword of the Universe) happened in a time during the regime of Emperor Qin Er Shi. Zhau Gao and Kuang Hong was in laws, with Zhau’s daughter married into Kuang’s family. Kuang showed his displeased about how Zhau was manipulating the Emperor caused revenge from Zhau. He has someone stole the well known Sword of the Universe from Kuang and had faked an attempt assassination of the Emperor. Thinking that it was Kuang, the Emperor ordered the execution of the Kuang family. Kuang’s son escaped while his wife Yan Rong (Zhau’s daughter) returned to his father’s home. The Emperor seeing the beautiful Yan Rong and wanted to have her as a concubine but she hated his notorious style of ruling and his father’s treatment to teh Kuang family, she pretended to have gone made in order to escape the Emperor. 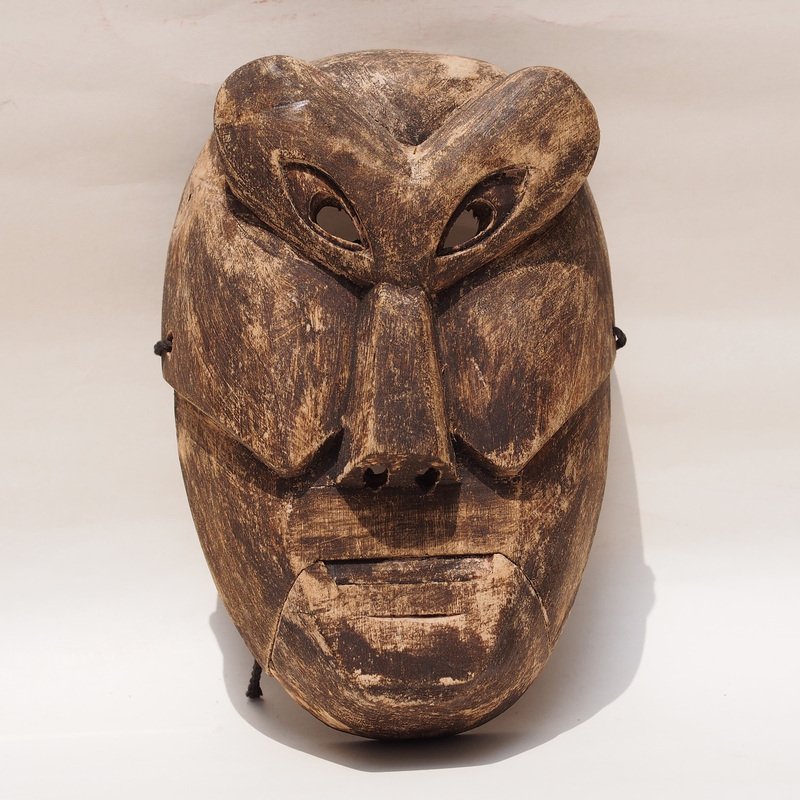 A ceramic mask from Mexico. 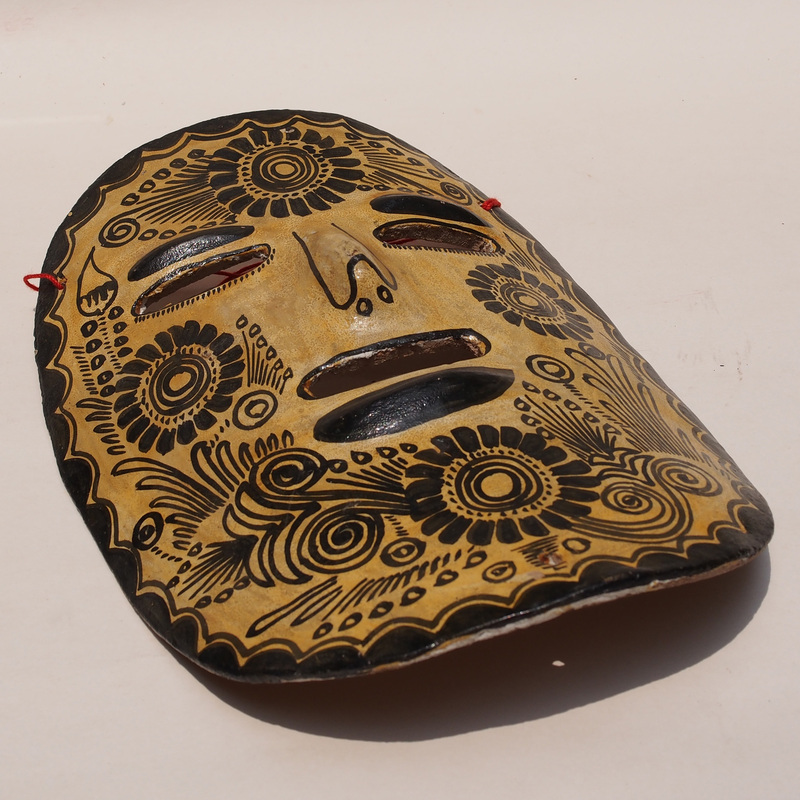 Masks are integrated into the Mexican culture; long before the arrival of the Hispanic influences masks were used in ceremony and ritualistic dances. These mask festivals were performed to honour the spirits for these blessing of a good weather, harvest and general well being. At the time of birth, adulthood, marriage, reign and death, masked dances were also used to gain the protection of the spirits. As a well to control indigenous culture, masks were banned in the beginning of the Spanish rule. With the introduction of Catholic and Christian religion, characters, stories and teaching of the religion were portrayed in the new mask dances. 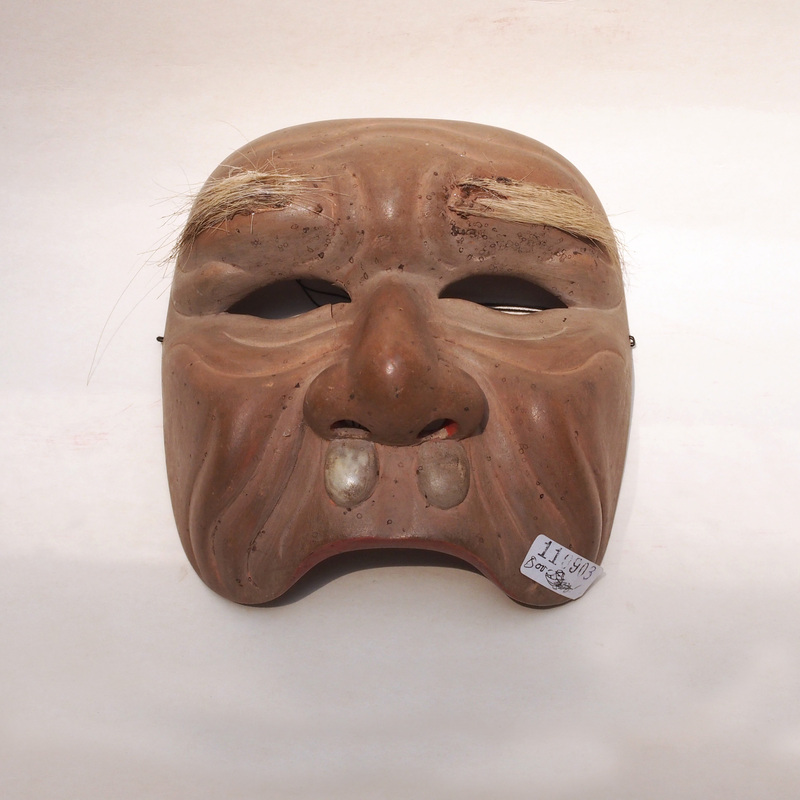 This is a mask for the female role (Dan) in the Chinese theatre. Strangely, it is not portrayed as a beautiful female but a rather comical. 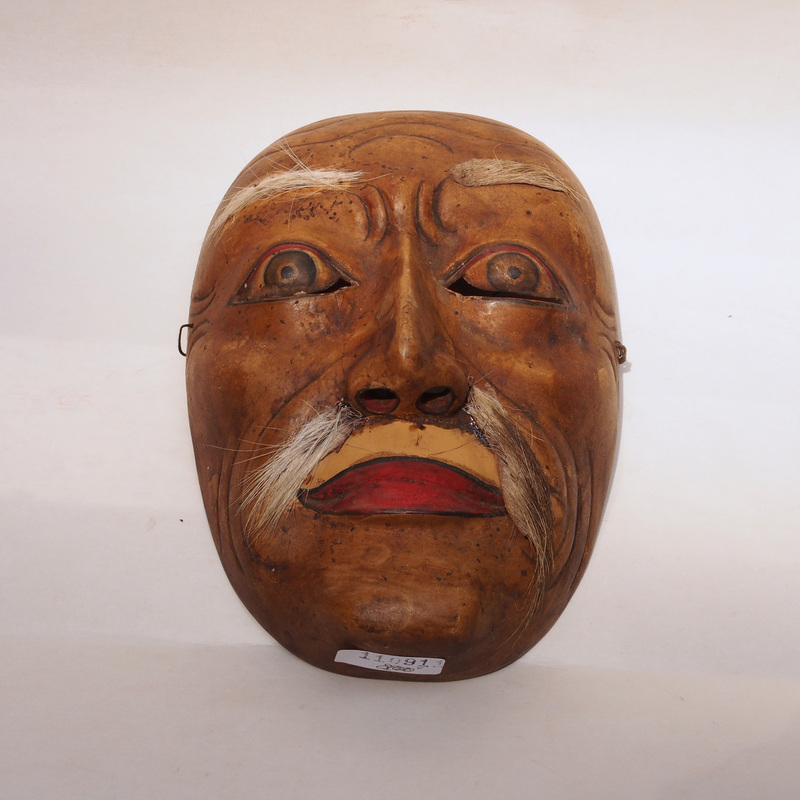 This is because the mask is that of a Cai Dan (the clown). Like all good theatre, the clown is essential. Within the dan catagory there were the Gui Men Dan (known for the singing), the Hua Dan (specialized in movement and speech), the Wu Dan (the Chinese version of Laura Croft), Lao Dan (the older women) and Cai Dan (the clown). 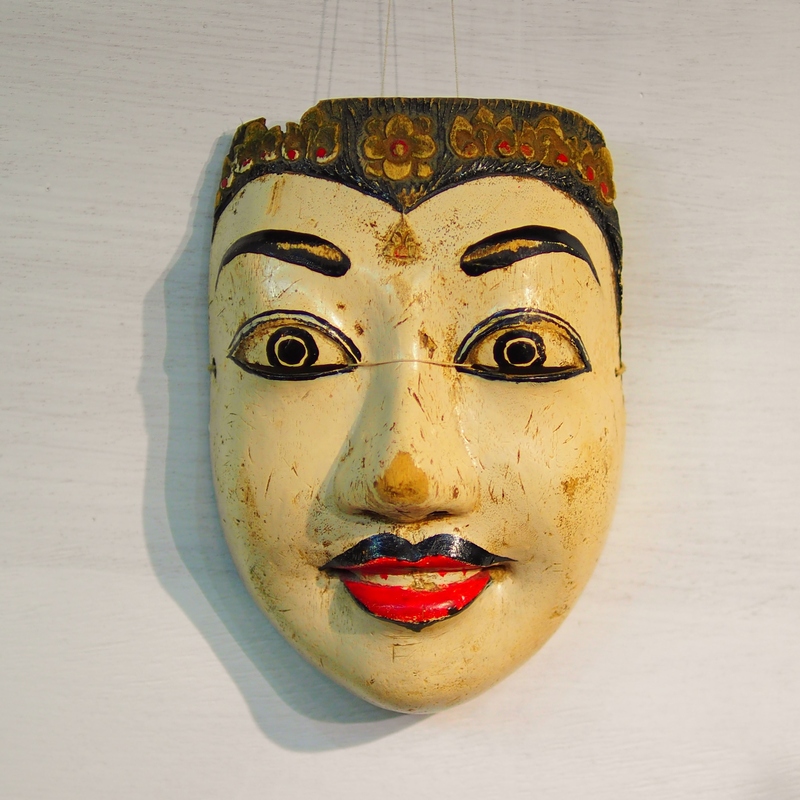 This is a mask of Jinggananom, a rebellious fighter in the masked dance of Topeng Cirebon, the masked dance of West Java. Two touching documentary tributed to the late maestro Mimi Rasinah. 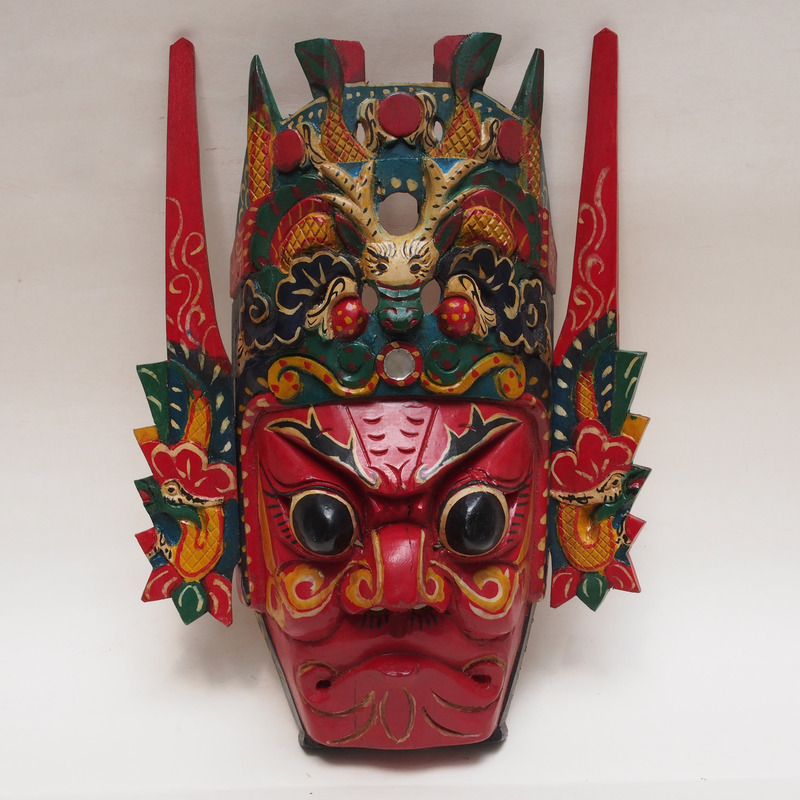 This is a warrior mask of the Chinese Ground Theatre (Di Xi). A form of theater which based on the warring theme. The character of the masks can be broadly divided into 4 catagories; generals, saints, clowns and animals. The generals would wear helmets, like this one; and consists of warriors, intellectuals, female, old and young generals. 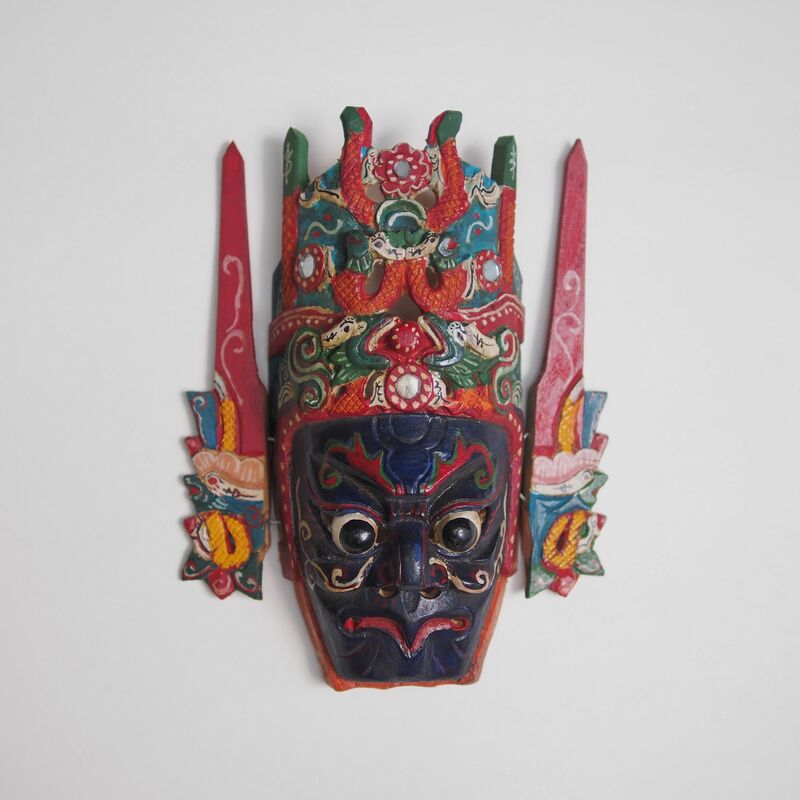 This particular mask belongs to the warrior general which the blue face symbolizes bravery and a strong character. The saint types are masks with a weird features, e.g. a beak; they are powerful figures which comes to assist the generals on wars. As in all theatres, di xi cannot be without the clowns, often character of distorted faces. Lastly, the animals; the fierceful lion and tiger, the tamed horse, the stipid pig, hard working ox, endearing dog and the cheeky monkey.